As much as Orlando Pirates have been able to find the back of the net lately, there are concerns over the team’s leaking defence, which has conceded 11 goals so far. 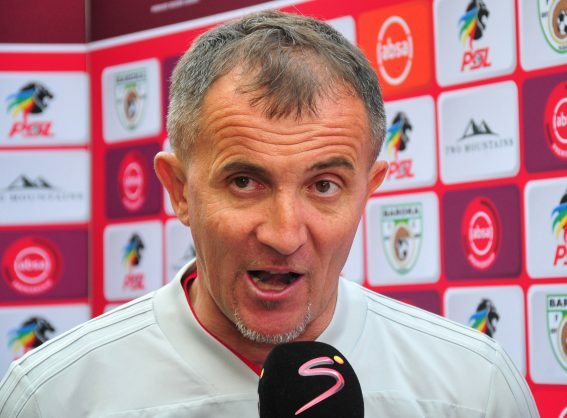 Coach Micho Sredojevic, however, defended the team’s failure to stop conceding goals after their 2-1 victory over Polokwane City at the Peter Mokaba Stadium on Tuesday. The Serbaina mentor says Pirates’ way of play makes them run the risk of allowing opponents to score. He does admit they will have to come up with a solution to fix the problem. “We have a team that plays football in our own way, we are risking, we are not sitting back and trying to close. Our badge and history is obliging us to be offensive, and when you are offensive it is normal that you are likely to concede,” said Micho. The victory over the Limpopo outfit saw Bucs jump to the summit of the Absa Premiership log with 22 points after 12 games, two points ahead of second-placed Bidvest Wits who have two games in hand. Sredojevic praised his charges and technical team, saying it was a good win against a tough Polokwane City side and ahead of a daunting league game against Mamelodi Sundowns at Loftus Versfeld Stadium on Saturday. “I want to give credit to the players, they have given everything for the badge and jersey, credit to the technical team that has gone to the deepest analysis of the weaknesses and strengths of the Polokwane team.